Our liability insurance as a flatrate: you pay one price, your annual subscription always includes all premium benefits and automatically adapts to your needs. A self-inflicted damage can be very expensive for you. For this reason, we secure you with EUR 50m. Even insured events that are not covered by our protection at first, but included with other german insurers, are then automatically included. Annoying comparisons are no longer needed. Stefan is one of the FinTech pioneers in Germany. In 2011, he founded one of the first InsurTech-Labs in Hamburg. Together with the Karlsruhe Institute of Technology (KIT), Stefan described the future development of digital insurance markets. He also established the „Institute for Applied Consciousness Research“ and was appointed as a party-independent member in the „Future of the Civil Society” commission set up by Federal Chancellor Dr. Angela Merkel. 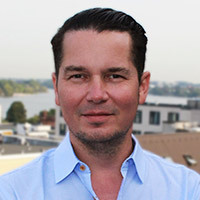 In 2015, he and his partners founded „INSURANCE HERO“ and published the brand „HAFTPFLICHT HELDEN“ – the first „full digital player“ in Germany. Stefan is a member of the „Bundesfachkommission Internet und Digitale Wirtschaft” in Berlin.